BOUGAINVILLE President John Momis has expressed deep anger at Rio Tinto’s refusal to accept responsibility for the environmental and other damages caused by the Panguna Copper mine in Central Bougainville. This comes as Rio Tinto announced it is divesting its shares in Bougainville Copper Limited, former operator of the mine. Mr Momis met with two Rio Tinto officials in Port Moresby on Wednesday in what has been described by an insider as a "very tense meeting". Mr Momis said yesterday that in previous meetings he had insisted that Rio Tinto accept responsibility for mining legacy issues. "When I met their officials last night (Wednesday) in Port Moresby, they flatly rejected any responsibility for their contribution to the damage done by the Panguna Mine," he said. "Rio’s officials gave me two reasons for not accepting responsibility for mine impacts. First, Rio operated under the PNG law of the day. Second, they were forced out of Panguna by the conflict. "But the truth is Rio Tinto generated huge revenues from what we all now know were the terrible injustice of its Bougainville mining operations." Mr Momis said that the mine shut down in 1989 only because anger over that injustice generated demands for a renegotiated agreement. 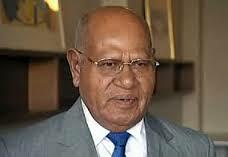 He said that it is now clear the Bougainville Copper Agreement (BCA) under which Panguna was operated was deeply unjust. "It ignored environmental damage and social impacts. Only a tiny share of mine revenue was distributed to landowners and to the North Solomons provincial government. "The gross injustice of the BCA has since been recognised by Rio. As a result it made major changes to its own policies, especially in relation to landowners. "It accepted new standards of sustainable development as a founder of the International Council on Mining and Metals. Rio is now deeply hypocritical in its blatant disregard of the higher corporate responsibility standards it says it has adopted. "Now Rio Tinto proposes to walk away from responsibility for the effects of the injustice of its highly profitable operations. The President said he will be writing to the managing director of Rio Tinto asking him to reconsider not only the Rio decision about its shares, but also its refusal to deal with its Panguna legacy responsibilities.